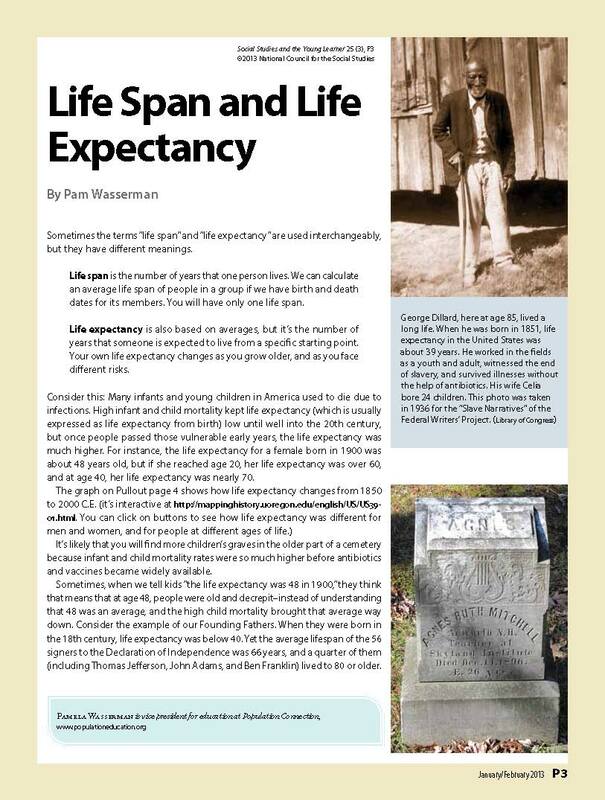 An annotated list of children’s books that we recommend to enhance the teaching of Population Education lesson plans and help bring content literacy into the classroom. A list of 15 reads for Summer 2014 – a little fact, a little fiction, and a whole lot of fun. 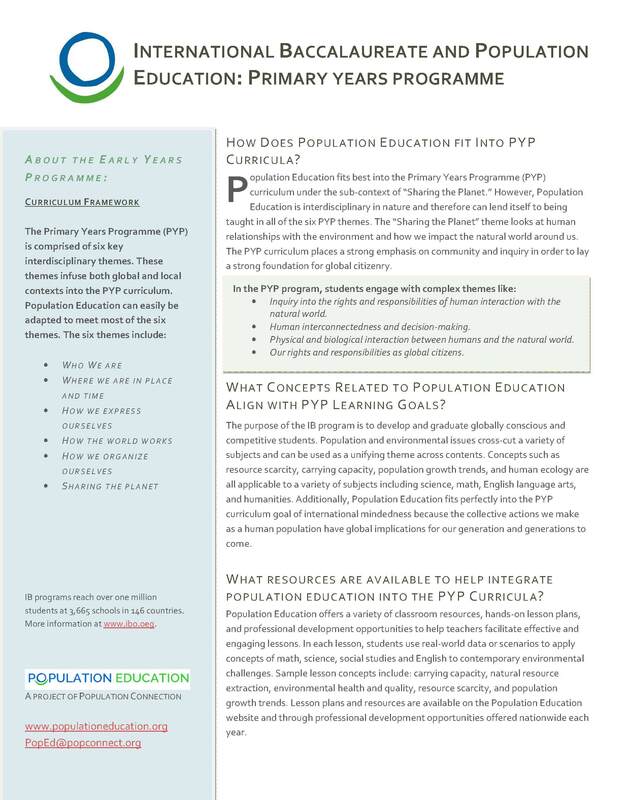 An overview of the concepts and themes covered throughout the Population Education program — the history of our growth and how agriculture and technology enabled our increase; the concept of zero population growth (zpg) and carrying capacity; statistics showing the impact of our growth and consumption. 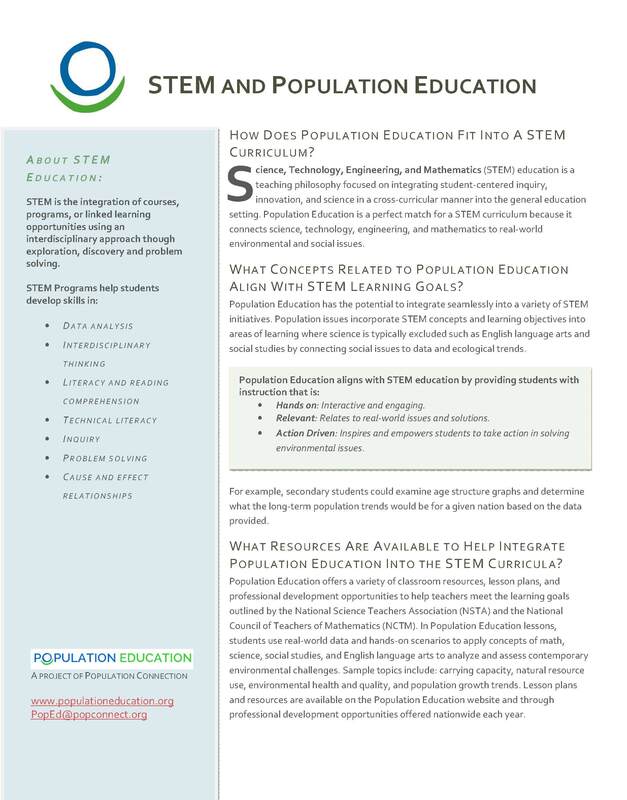 By emphasizing creativity, collaboration, and civic and environmental literacy, Population Education activities address both the skills and the core themes laid out in the 21st Century Skills. The Common Core Standards call for contextual learning, higher order thinking, and adaptive reasoning in English language arts and mathematics. 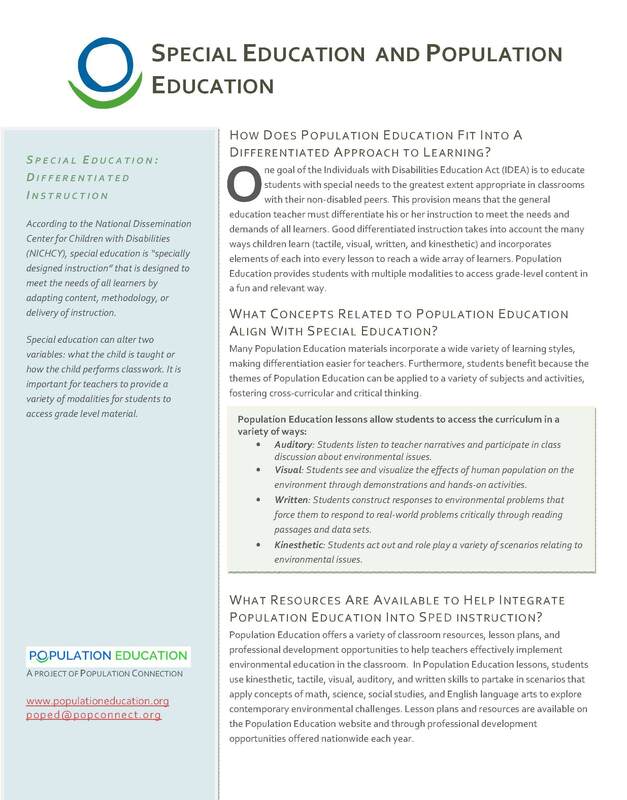 Population Education materials give students a framework for building these skills in a meaningful way. 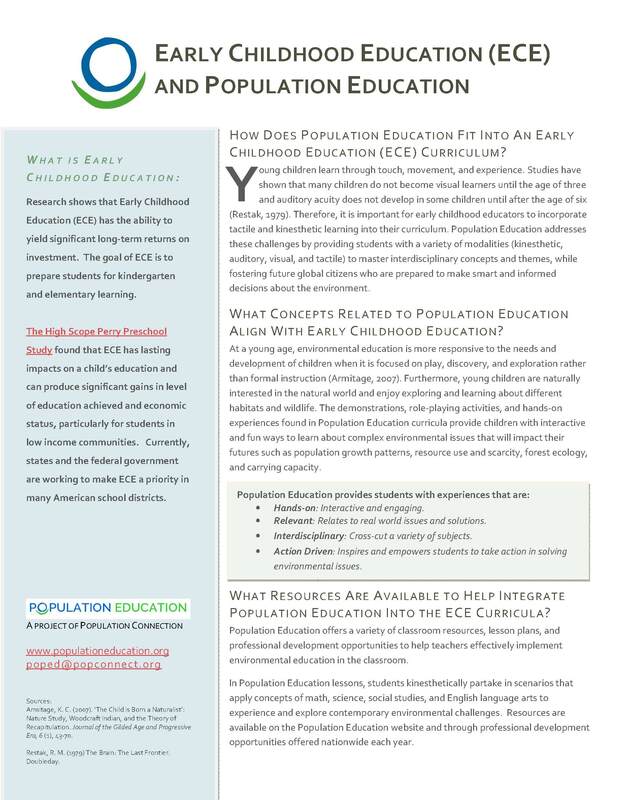 By using tactile, kinesthetic, and visual learning, Population Education brings environmental themes to the early childhood level, building a foundation for global citizenship at a young age. 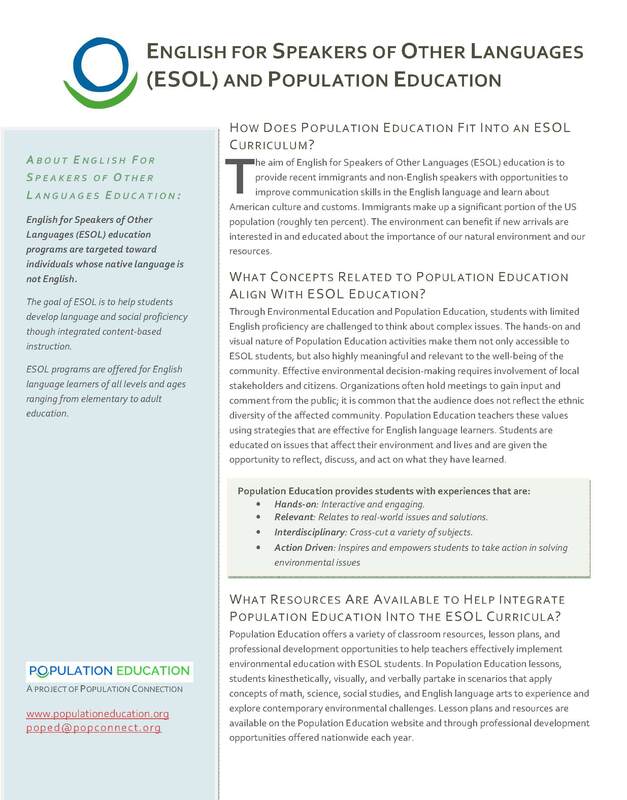 The hands-on and visual approach in Population Education lessons makes them accessible to ESOL students, while also promoting the importance of environmental stewardship. 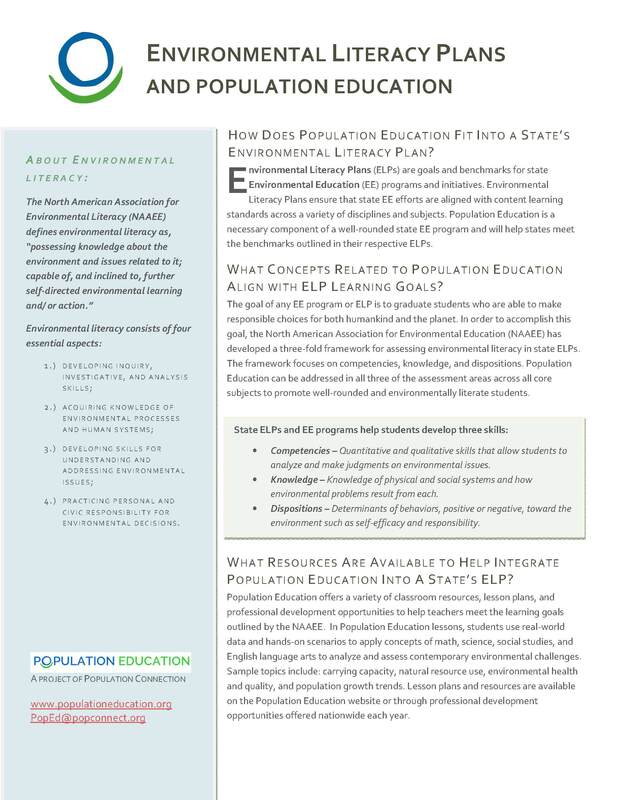 Population education is a necessary component of a well-rounded state environmental education program and will help states meet the benchmarks outlined in their respective ELPs. 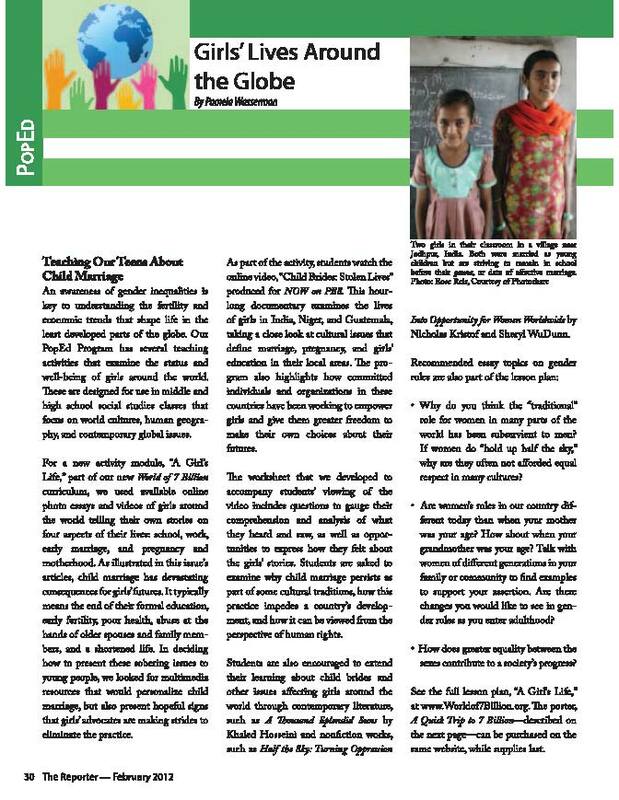 The IB Primary Years Programme emphasizes human relationships with the environment and focuses on the theme of “Sharing the Planet.” Population Education materials encourage students to think globally and consider the impacts of the natural world – a perfect fit for the six themes of the the IB Early Years Programme. 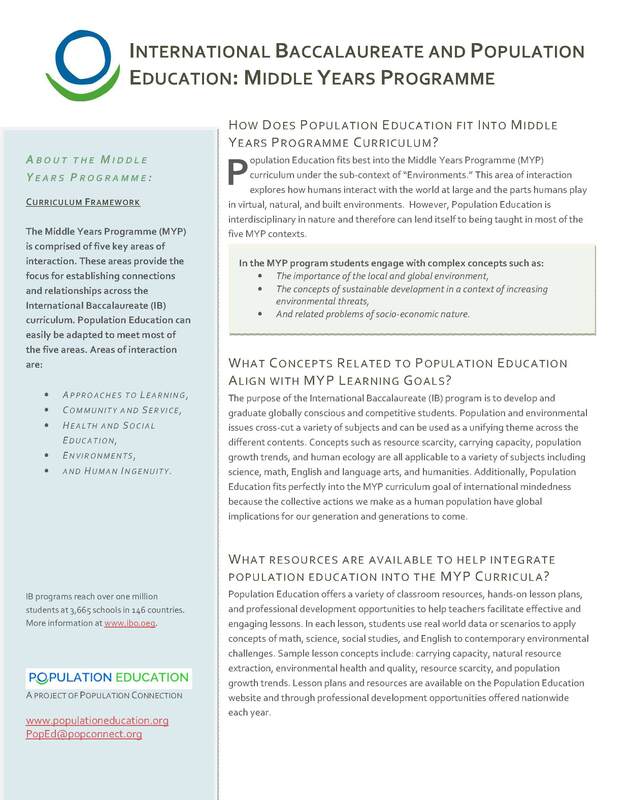 By exploring the interactions of people with the world at large, Population Education activities fit seamlessly within the sub-context of Environments in the Middle Years Programme. 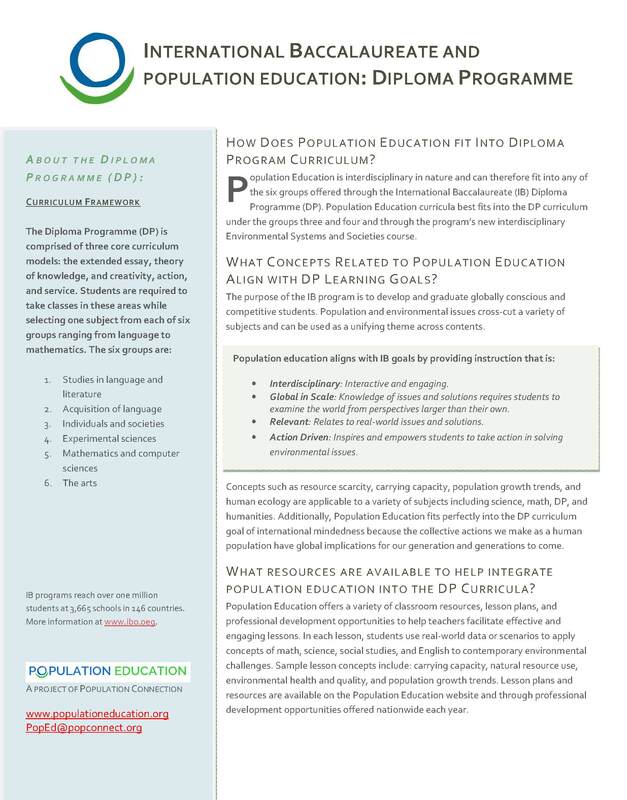 Population Education curricula emphasizes global consciousness and is a unifying topic across the six groups of the IB Diploma Programme. 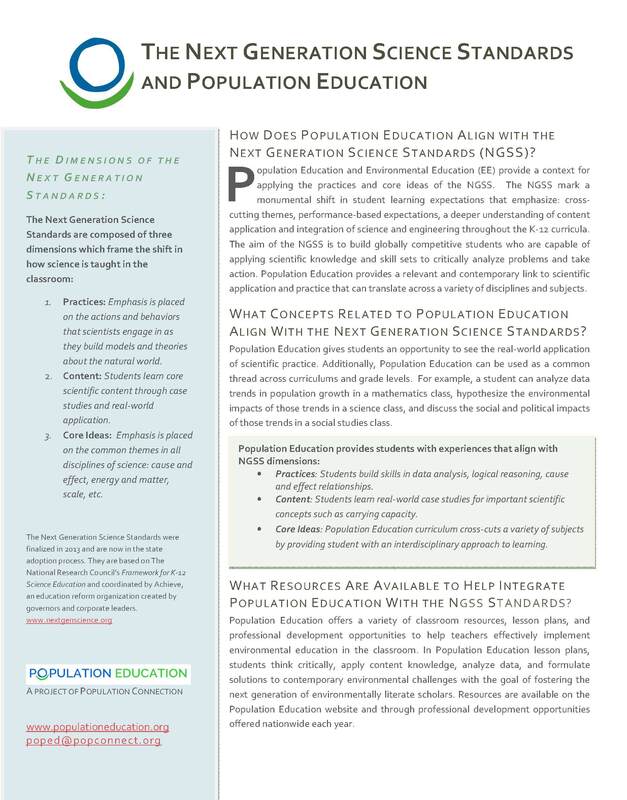 Population Education activities allow for real-world application of science concepts and can be used as a cross-cutting theme across grade levels and subject areas. 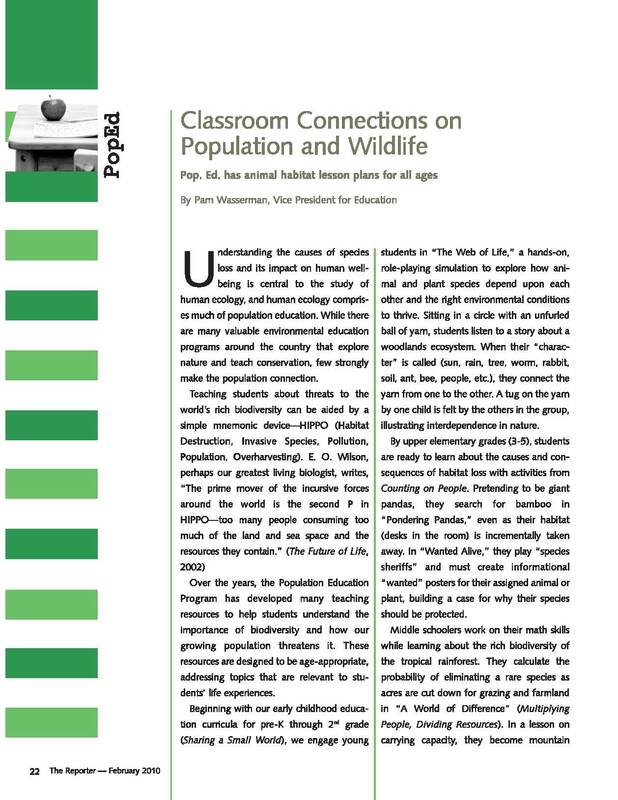 A variety of teaching strategies and interdisciplinary themes are used in Population Education lessons, allowing teachers to easily differentiate for tactile, visual, written and kinesthetic learners and to reinforce knowledge in multiple contexts. 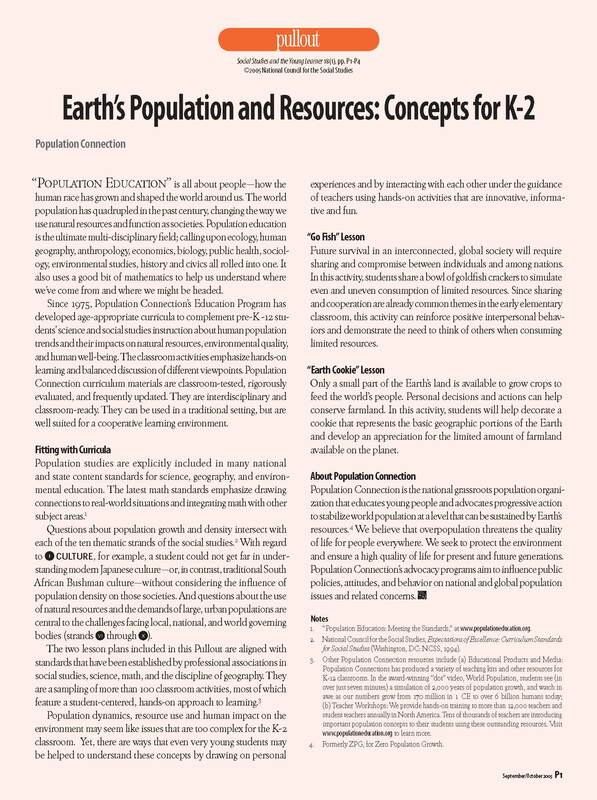 In Population Education activities concepts in science, technology, engineering and math are explored through student-centered activities which promote inquiry about real-world issues. 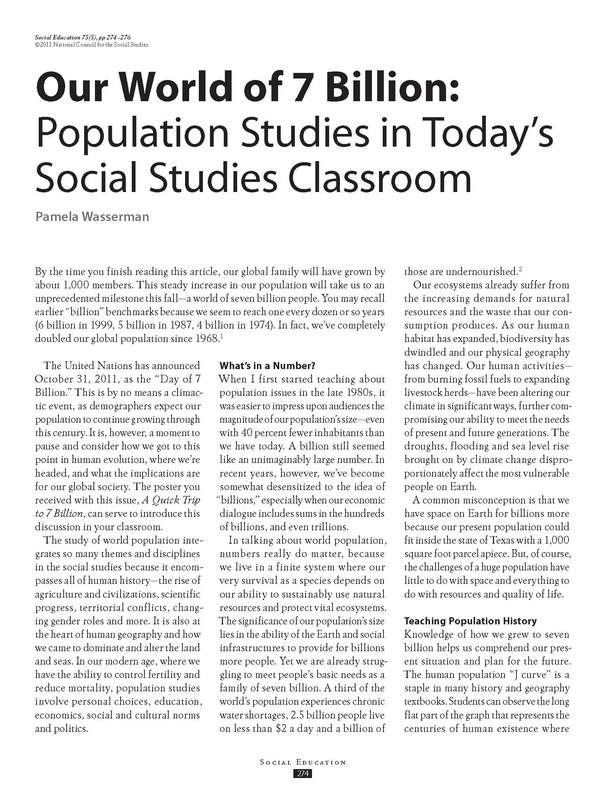 From Social Studies and the Young Learner (a publication of the National Council for the Social Studies), September/October 2005; Author: Pamela Wasserman. 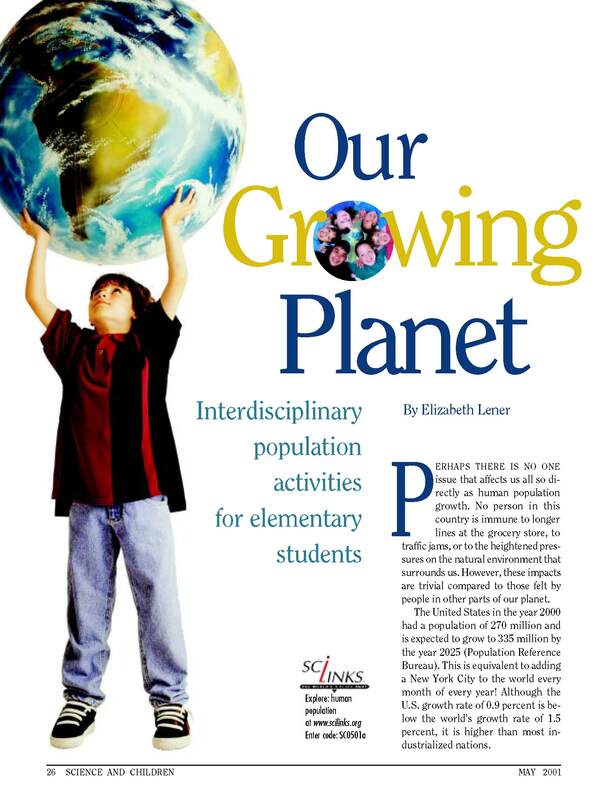 From Science and Children (a publication of the National Science Teachers Association), May 2001; Author: Elizabeth Lerner.